With the emergence of Scottish Target Shooting as the professionally-run umbrella body in Scotland, from now on any competition info, membership data, and results will sent and publicised primarily via the STS website where queries can also be made. Rest assured, however, that results from 2017 competitions still currently running, such as the recently-concluded SSRA Prone Indoor League plus the SSRA/STS Team Prone Indoor League, will be archived in good time to the Domestic Results page for the forseeable future. Also, links via the SSRA Facebook page will continue as required. With Vikki Walls, Alloa away training in Norway, the final shoot of the season was eagerly awaited by shooters in attendance at Glenrothes. She could be pipped for the overall GP Air Championship by clubmate Seonaid McIntosh, provided the latter could beat her sister Jen. In the final, Seonaid had an advantage of 1.9 after 10 shots, with the early leader Keira Bexley of Target Technique, in third. As the final progressed Seonaid gradually built up a small lead. She eventually emerged as the winner by 3.0 over Jen. This stupendous effort ensured her overall victory in the GP series. The scores are on the door for the first two rounds of the SSRA/STA team prone league. New entrants from the Isle of Man, Kirk Michael Rifle club, scored a debut victory. Visit the Domestic Results page for all the scores. This year's Watsonian Rifle Club Open Meeting will be held on the Saturday 3rd and Sunday 4th of December. Click here for the entry form. 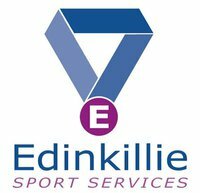 This year there will be a "Guess the number of empty cases" competition, the prize being a £50 voucher very kindly donated by Edinkillie Sport Services. The Scotland team had a clear victory over North Island, New Zealand in the annual match. Scotland did the business as Balerno & Currie's range. The scores can be found here. The 2016 CSF(ED) event is spread across several venues and even nations with Pistol events staged in Jersey and the Rifle events in Cardiff from 22-15 September. Women’s Prone: Fiona Crowden, Sarah Henderson. Women’s Prone (Development): Georgia Gooch. Women’s Air: Victoria Walls. A number of Scottish officials will be assisting with the event. The programme for the 2016-17 Air Rifle GP series has been unveiled. There is a problem with the usual website calendar but the dates and venues are as follows: Sunday October 9, 2016: GP1 at Glenrothes; Sunday November 13, 2016: GP2 at Denwood; Sunday December 11, 2016: GP3 at Kincardine; Saturday January 14, 2017: GP4 at Carlisle; Saturday February 11, 2017: GP5 at Glenrothes. The SSRA Prone Grand Prix Series is over after our Megalink cyber-army marched from Denwood in Aberdeen overnight to Gagie outside Dundee in time for an 8.30am start. 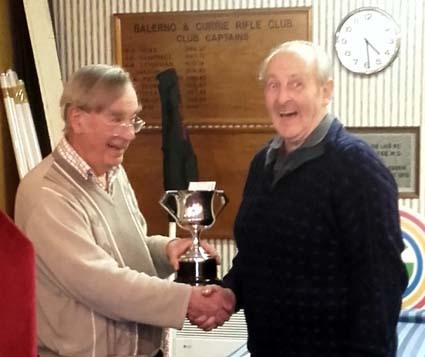 Bill Vaughan was the winner of the main final on the day and Jim Main held his nerve to win the series overall. Ian Henderson won the C&D series after Scott Norval took the plaudits in the C&D final. The time is nigh to begin the 2016-17 Team Prone Rifle League (Formerly the SSRA Team Prone League). Get your club's entries in to Billy Crawford <billyhcrawford@sky.com> by the end of October. The competition is locally scored. A new national postal competition has been devised by Huntly Small-bore Rifle Club. They have been very fortunate to secure £1250 of sponsorship as prize money. 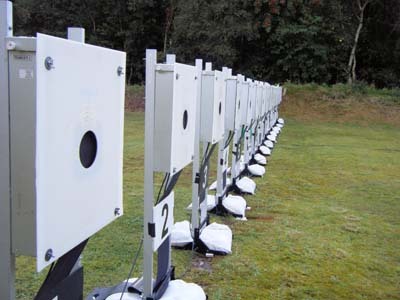 The entry money will, along with other fundraising efforts, go towards new club equipment, including electronic targets. There are four classes: 1st prize - £200, 2nd prize - £50 in each class with an entry fee of only £5. The club with the highest number of individual entries will receive a special prize of £250. An entry form can be found here and look out for regular updates on the club's Facebook page. The closing date for entries is 28 October 2016 and the scores for the first round must be returned by Monday 12 December 2016. The entry form can be found here and thanks to Jackie Smith of HSBRC membership secretary for this exciting news. you can read Ian Thomson's report from the Junior Internationals here. The scores from the recent 50m match at Tullygarth are available here and if that well-attended event whetted your appetite, why not enter their next competition, the Forth & Clyde Double Dewar competition on Sunday 28 August? You can enter on the day, just provide a certified average. The Scottish 50m Championships, staged over two days at Denwood in Aberdeen, produced some great scores and tense finals. The results book can be found here. Alloa Rifle Club is staging a shoot on August 6 & 7 at the Tullygarth range. The course of fire is 60 shots at 50 metres (English match). For more details and to obtain an entry form, please contact organiser Willie McAulay. St Andrews and Alloa shooter Ken Greenaway won the Earl Haig final at the NSRA Scottish event in Lauder. Bill Vaughan was second with Lenny Thomson third. The C&D final was won by Perth's Stephen Gemmell. In the traditional Home International matches, the Main Scottish team lots to England by two points, while the Ladies were also beaten by their English counterparts. The Junior matches were hampered by the lack of competition from England, so our Scottish Junior team of three had a match against a team of three from St Andrews University - which they won comfortably. The previous day had seen Graham Shedden make off with the Wilkinson Sword in The Freuchie and Ewan Scougall win the Sgian Dubh in C&D class. Click here for some picture highlights. The trophies for the C&D Speedway (The Boston Bowl) and the Indoor 3P championship (The Watsonian Trophy) are currently missing despite the efforts of Jim McIntosh to track them down. I have a personal interest in these trophies as the former was donated to the SSRA for annual competition by my late mother (born in Boston and hence the name) and is high-quality American silver-plate. The latter was presented by myself at some expense. I do not want them left mouldering in someone's attic for the unforeseeable future and just be forgotten about. If you have any information about the whereabouts of either of these trophies please get in touch with the webmaster in the first instance with a view to having them returned. Jim Main took advantage of relatively light winds on a chilly day to come out on top in this SSRA Prone Grand Prix. As the Caithness event is run on paper targets, the final is not conducted in a "return to zero" format and Jim's even-point lead from qualifying, where he scored 594, set him up nicely. Scores are to be found on the Domestic Results page. Alloa's popular and well-attended Double Dewar is to be to be held on the 25th and 26th June 2016 at the Tullygarth range. Click here for an entry form. The West of Scotland Small-bore Rifle Association will stage their Open competition at Alloa's Tullygarth range on Saturday June 4. Details of the event and how to enter can be found here. All the scores from Sunday's meeting at Denwood are available via the Domestic Results Page. Scores from the NSRA's Scottish Short Range Championships are available here and the Junior results here. Look also on the Domestic Results page for the final state of play from the SSRA Team Prone League and the SSRA Prone League. 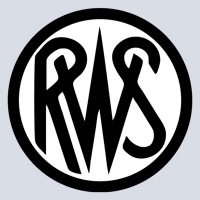 Further results from the SSRA's winter competitions are also on line. This competition is now confirmed as June 11, 2016 and the entry forms for this (together with information on SSRA Grand Prix 3) and available from the following links, as a PDF and as a Word DocX file. Alloa & District Rifle Club is running another club instructor course and there places available. Dates are May 7 and 8 and there are spaces available. Contact mcaulay8580@btinternet.com for more information. Results and a summary from the recent Scottish Schools international matches can be found by clicking on the links. The results book from the Scottish Air Rifle Championships at Tulliallan is available here. The new STS web system for club and individual membership system is now live. See this STS sign up letter to see how to register as an STS member. Unfortunately there is no integration between the new STS membership system and the older SSRA competition pages. So, in the meantime, please continue to login to the SSRA competition entry system using your original SSRA number. St Andrews' Ken Greenaway, pictured right, emerged victorious in the finals of the SSRA's Speedway marathon, staged at Balerno & Currie's range. The sportinstitute of sport is working with Scottish Target Shooting Performance Programme and is currently looking to engage a World Class Smallbore Rifle Performance Coach to train Scottish athletes in their preparations to compete successfully at the Gold Coast 2018 Commonwealth Games and to gain selection to British Shooting teams. The coach will deliver coaching to key athletes in a training environment and also at competitions around the world as they prepare for the Games. For more details on the post and how to apply, click here. Deadline for applications noon Friday March 4, 2016. The Team Lists for the annual international matches can be found here. Maria Bexley won Air Rifle GP4 in the Kingdom of Fife and found the time to reflect on the victory: "I did indeed win, and over a few damn good shooters too. "What was surprising is that I had lent my equipment to my daughter Keira , it's all sized up for her now and I usually just use her settings. This GP she made it to the finals too - oh hell - so I borrowed a rifle and a pair of old size 10 boots and got there despite!" Due to flooding at Carlisle the SSRA's Air Rifle GP4 has been moved to Glenrothes, with the Rifle event on January 16, 2016 and the Pistol comp on Sunday January 17. Additionally, the news that our GP5 events clash with the NSRA's Air Championships at Bisley means that the final SSRA Air Rifle Grands Prix of the season will now be at Glenrothes on February 20 and the equivalent Pistol event on Sunday February 21. Our thanks for Cyril de Jonckheere for the updates.